1. What photography 'skill-level' do your tours suit? We welcome photographers of all skill levels. Our guides will be happy to assist anyone from beginner to expert; making sure you get the most from your photography tour. 2. What accommodation is provided? Twin share accommodation will be provided at one of Bruny Island Coastal Retreats fabulous properties. Single supplement may be available, an additional charge will apply, please contact us to discuss. All linen and towelling provided. 3. What is the tour group size? We limit the group size to 10.
numbers not being reached. See our Terms and Conditions for our trip cancellation policy. If you cancel and your spot is filled, we will refund all monies you have paid to Bruny Island Photography for the tour, less a $200 cancellation fee. All refunds will be paid in Australian Dollars and paid within 7-days less any bank fees. Refunds only cover monies you have paid to Bruny Island Photography for the tour. Warm clothing for night excursions. During winter we recommend you also bring gloves and head protection such as a hooded jacket or beanie. Thermal underwear is also recommended during the colder months. Hiking boots or sturdy shoes with ankle support which can handle uneven terrain. Water resistant shoes will help if ground conditions are wet. All major airlines fly into Hobart International Airport, daily. The airport is 25 minutes from central Hobart by car. The tour leaves from Brooke St. Pier, Franklin Wharf, in Hobart at 8am Thursday morning. The meeting point is the front of the Brooke St. Pier building, 12 Franklin Wharf, Hobart. You will be transported by boat to Bruny Island. We recommend you arrive the night before so you are fresh for your first day and not rushed. 7. What can I expect on the boat? The boat is enclosed with side opening windows and outside access to stern and bow. It can get pretty cold depending on the day. Warm clothing, hat, gloves and thermal underwear are recommended during the winter. The boat is equipped with body length sea jackets which are both wind and water-proof. Ginger tablets are provided for those who may suffer from motion sickness. Food and water will be provided on the boat. Your luggage will also be transported with you on the boat. 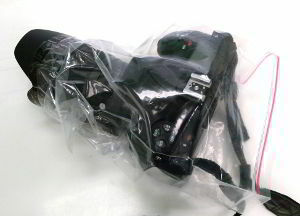 a water protection cover to keep your camera dry in case there is excessive ocean spray. A simple plastic bag cover made from a zip lock bag and elastic band is sufficient. 8. How much travelling is there on the tour? As we are staying on the island, the maximum travelling time between the accommodation and photo shoot locations is about 30 minutes. You will be transported in one of two people movers, with a specific place to store your camera bag. 9. What photo shoot locations will we be going to? The tour includes well known tourist spots such as the Bruny Island Neck and Cape Bruny Lighthouse. In addition, a number of the main photo locations are situated on private property not accessible to the public. We pride ourselves in giving you the ultimate photographic experience that allows you to immerse yourself in the natural environment without having to fight for the best photo spots. 10. What tuition is available on the tour? You will have exclusive access to our professional photographers while on the tour. Post processing assitance and tuition will be conducted in a relaxed environment tailored to the groups needs. 11. What shops and services are available during the tour? We recommend you bring everything you need as we will be staying in a remote location. The nearest shops are about 45 minutes drive away. 12. What phone and internet coverage is available? We recommend Telstra 4G, as it has the best coverage in the area. Optus network coverage is also available, but less reliable. We also recommend you have equipment insurance. We will not be responsible for any equipment loss or damage. 14. How 'fit' do I need to be? A reasonable level of walking fitness is required, as you will need the ability to negotiate uneven ground and walk up hills carrying your own equipment. 15. How does Bruny Island Photography support the environment? Bruny Island Photography, along with its partners 'Nature Pact' and 'Bruny Island Coastal Retreats', are passionate about preserving Bruny Island's natural and cultural environment. Profit from Bruny Island Photography Tours are used for these preservation efforts.